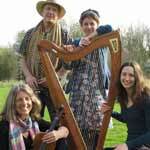 The Moonrakers are a four-piece band play both traditional tunes and also contemporary songs and melodies in the traditional idiom. Much of their music is based around the Celtic harp but there are also huge contributions from the fiddle, guitar, bouzouki and bodhran. Moonrakers are certainly not short of accolades. Their music has been described as “exquisite” by a BBC reviewer, and according to Living Tradition, the band “just oozes quality. The band have been creating a lot of interest in their native Oxforshire and they’re keen to progress and reach out to wider audiences. They have produced three albums so far, the latest being Bird on the Wing. As well as appearing in concerts and at festivals, they also run song writing and guitar workshops.